Methodios, Module Proxy is an Ultra Minotaur seen leading a group of Sol Imminent units in the Fields of Glass. Methodios will spawn after killing waves of Descendants. It will bombard the player with Void blasts while moving around near the Lighthouse. 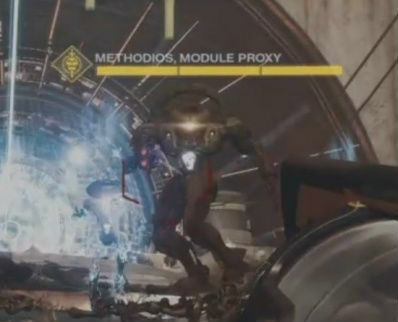 Killing the Proxy will allow the player to destroy the levitating cube and enter the Lighthouse. As Methodios as the word, "method" and the word "module" means a set of complex parts, it could be that Methodios is able to create intricate components using smart thinking of methods.